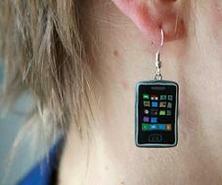 Nothing screams dedication to the iPhone like a pair of shrunken down iPhone 3G earrings dangling from your ear lobes. They’re great for those whose iPhone is akin to their right arm. If you can’t bear to be away from your iPhone for any lengthy period of time, say, when it needs a recharge or you’ve (shock horror) accidentally left it at your mate’s house, this is at least one way to ensure you’re close to your iPhone at all times. You’ll be the biggest geek in the room that’s for sure. You can nab yourself a pair from where else, but the home of bespoke jewellery extraordinaires – Etsy for $22 USD.